Retreat to your Outdoor Oasis! Escape the stress of the day just by stepping outside. Escape the stress of the day just by stepping outside. 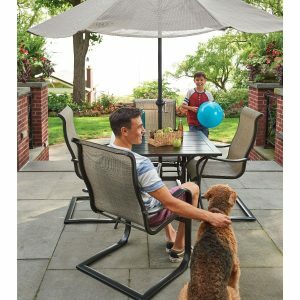 We offer a wide array of patio furniture, decor and grills that make your outdoor space a natural extension of your home. 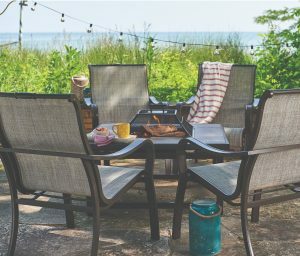 Lakeside, poolside or in your backyard, we specialize in design that reﬂects your family’s personal style and budget. 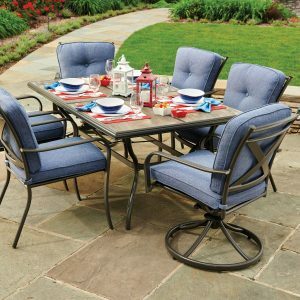 The Portland collection boasts high style and rugged construction. The combination of hardwood lattice and slat construction, plus the distressed blue finish make this set the focal point of any patio. As comfortable as your favorite pair of jeans. The denim cushions of the Beaumont Collection are long-wearing and contrast smartly with the smoke gray frames. 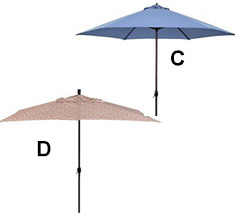 Frames are lightweight aluminum that resist rust and fading. Choose from 3 table sizes, all with attractive pewter finished, rust-proof aluminum frames. 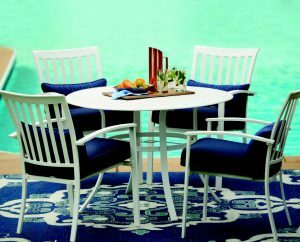 You’ll love kicking back on the C-spring chairs. 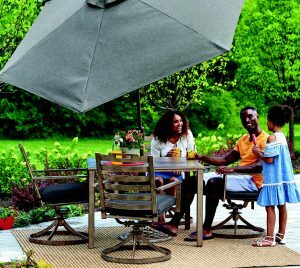 Extend outdoor fun with family and friends when the weather begins to cool. 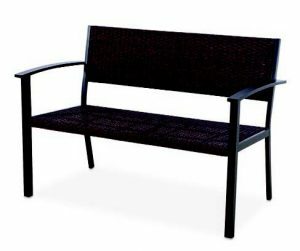 Decorative edge with steel leg base construction. Dome shaped screen in high temperature paint. 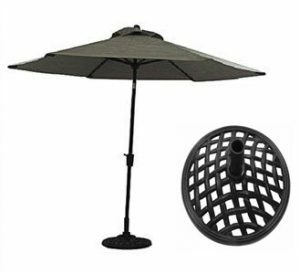 Fire grate, fire tool and a cover included. Open side wall design. Includes spark screen and poker. Mexican clay outdoor fireplace. 42-in. high, including stand and lid. 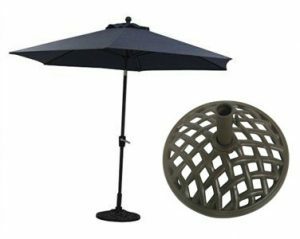 Stylish outdoor patio heater, steel body frame with hammertone bronze finish & 2 piece pole, 40,000 btu heat output rating, heating area around 210 sq. Ft.
4-side mesh screens help contain sparks and allow viewing from all sides. 40,000 btu adjustable heat output with stunning 360 degree visual effect central flame delivers even heating area of 500sq feet. Access door wheels for easy moving hose and regulator included. All-weather wicker over durable powder-coat steel frames. 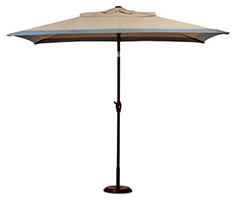 Sunbrella® Spectrum Mist 100% acrylic-covered cushions. 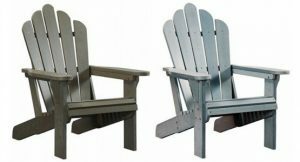 Rust-proof slat back aluminum frames with deep-seating olefin cushions. 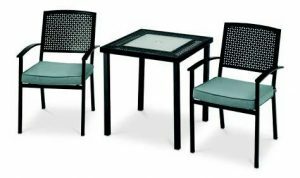 Slat-top table is 43L x 26H in. 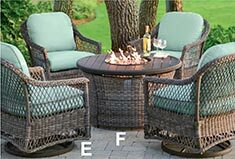 Wicker back with cushion stationary dining chair, hand woven all weather wicker back & comfortable UV protected olefin seat cushion. 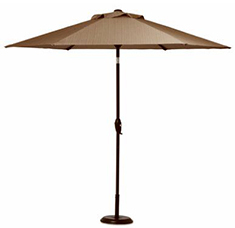 A durable steel frame is e-coated for rust resistance & has a dark brown baked on frame finish. 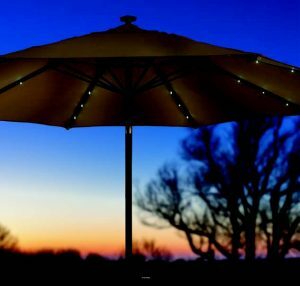 Concord Umbrella, 7-Ft. x 9-Ft.
Concord Patio Collection Sling Umbrella, Tan & Brown, 9-Ft.
Take a break from the sun under colors that are fun! 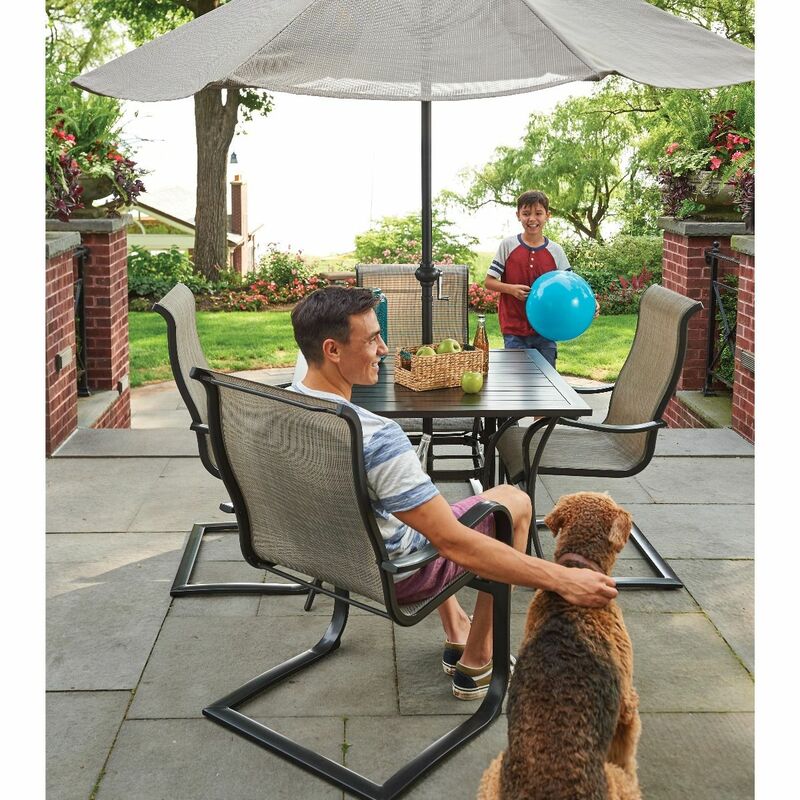 Durable contemporary design brings style & harmony to any outdoor setting. Ideal for storing cushions, garden & pool accessories. 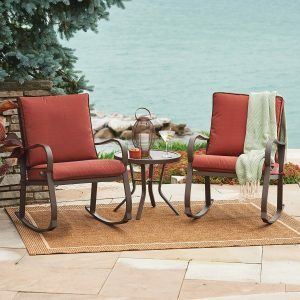 Brown Wicker-Look Resin, 50 x 25.6 x 25.5-In., 99-Gals. Easy assembly. Long lasting resin construction. Java Wicker-Look Resin, 46 x 21.6 x 22.5-In., 73-Gals. 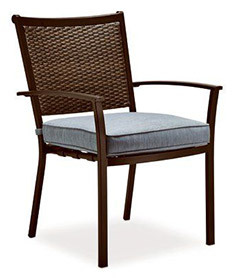 Wicker-look double wall resin construction with gas-shock hinged lid. 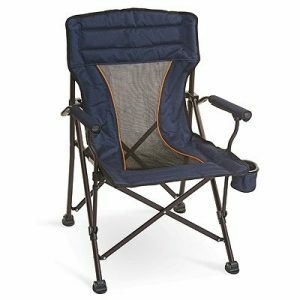 Measures 26W x 27D x 26¼H in. 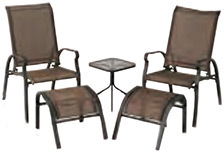 All pieces in this St. Augustine Collection boast mocha finished, rust-proof aluminum frames. Enjoy their lightweight durability that stays cooler than steel in the sun. 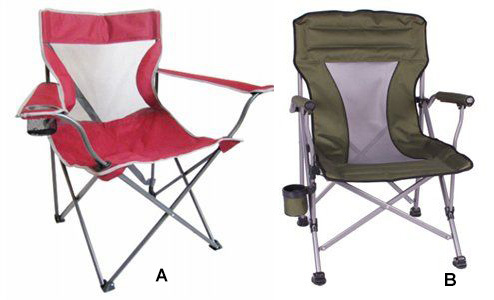 Relax in the great outdoors with a chair rugged enough to stand up to the elements. This All-Weather Adirondack Chair is built tough to last season after season. Snow? No problem. Rain? Not an issue. With a chair this tough there’s no worries. Only kicking back and relaxing. 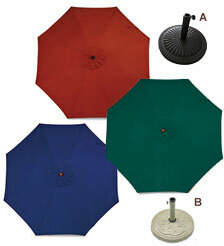 Gray TV244243, Blue TV244242, Red TV244244, Tan TV244245. 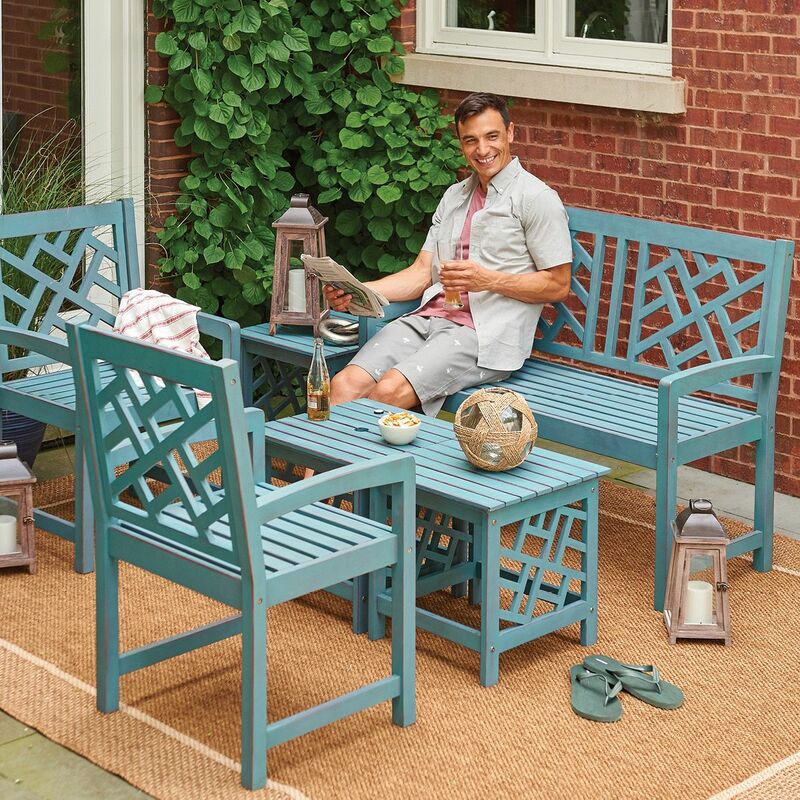 Sturdy steel frames have a hand-painted woven wood-look finish. 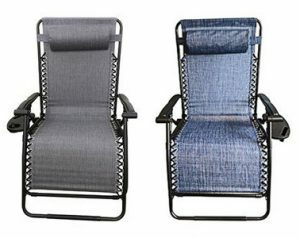 Relax comfortably on olefin fabric seat and lumbar cushions. Rust-resistant, electro-coating stamped steel frames with durable Olefin fabric seat cushions. 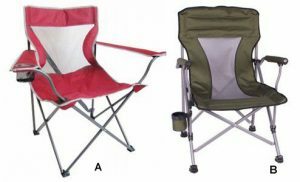 Includes 2 stackable chairs and 27-in. 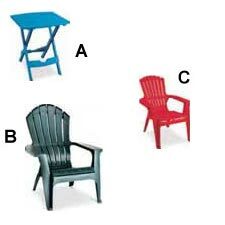 Seating design is perfect for smaller spaces. 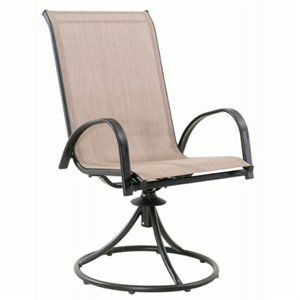 Heavy-duty powder-coat steel frame. 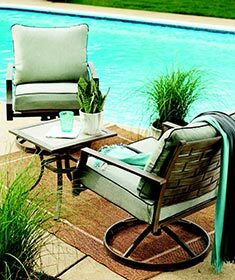 Woven taupe sling fabric seat and back. Includes 26-in. 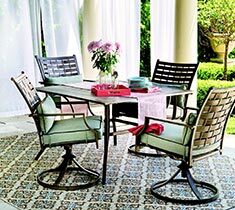 square tile top table and 2 sling fabric swivel chairs. 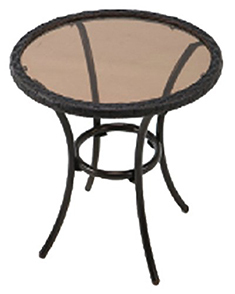 Fairlane Side Table, Glass Top, 20 x 20 x 18-In. 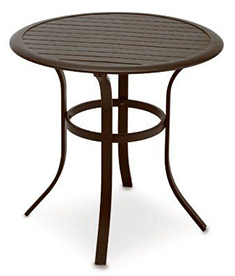 Four Seasons Courtyard Fairlane side table, a glass table top with hand woven all weather woven table rim, durable steel frame that’s e-coated for rust resistance & a brown baked on frame finish. 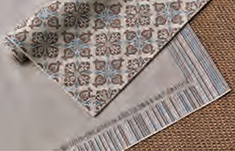 Durable, weather-resistant 100% polypropylene rugs give the look of natural fibers. Sturdy steel frame. Mesh back insert. Built-in cup holder and carrying case. 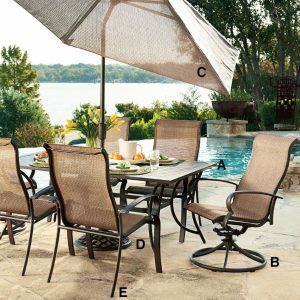 Bellevue Aluminum Slat-Top Bistro Table, 30-In. 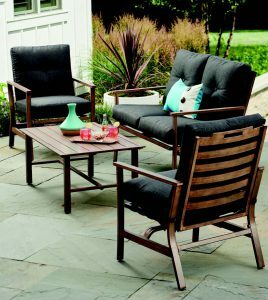 Bellevue, 3 piece, deep seating chat set, includes 2 cushion swivel rockers & 24″ glass top accent table, espresso rust free aluminum frames, durable latte colored olefin cushions. Limited Quantities for all items that remain. 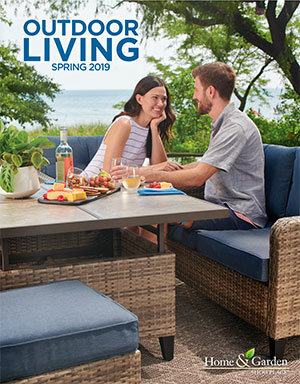 Click on the link below to view our entire Outdoor Living Catalog.